Julian Manning, Bar Manager at Poe’s Kitchen at the Rattlesnake "I've always been a huge fan of a well-done charcuterie plate and, with the up-swell in popularity of wild game and exotic meats, I'm really looking forward to tasting how this plays out in 2013." Jay Murray, Executive Chef at Grill 23 & Bar "I say it every year, but 2013 will mark my first visit for omakase at Oishii." Andrew Hebert, Executive Chef at TRADE "I really want to check out Will Gilson's new spot, Puritan and Co. I enjoyed every meal I had at Garden at the Cellar and look forward to seeing what he has in store at his new spot. Ashley Stanley, Founder & Executive Director of Lovin' Spoonfuls "Puritan & Co in Inman Square... I think everyone's been psyched for Will to get some bricks and put his name on something again. The space is fresh, and it's realllllllly good. 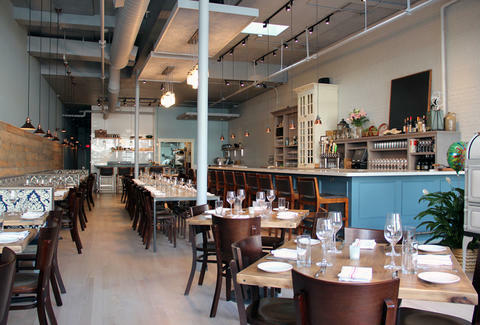 Tavern Road, Louis' [DiBiccari] new place that's going to be down in Ft. Point is on my list for sure. Ming Tsai's [Blue Dragon] is finally coming downtown. And as long as Joanne Chang keeps opening Flour's, I'll be a happy girl. Casey Carney, Beverage Director at Capiz Lounge "Gin infusions with anything and everything. It’s one of those liquors that doesn’t get a lot of action, but I have big plans for gin. Big plans. I am going to set it up as a weekly series at the bar. Bryce Mack, General Manager at Canary Square "Buffalo Trace Distillery's Antique Collection. Aaron Cohen, Founder of Eat Boston "Chicken nuggets at Tasty Burger are so good. The Italian Grinder at Coppa is my favorite sandwich in Boston. The foie and frisee salad at Puritan & Co will get people excited. Hadley Douglas, Owner of The Urban Grape "We hope that 2013 is the year Trillium Brewery in Fort Point finally starts bottling and selling their beer. People have been on knife’s edge for 12 months waiting for them to open. Hopefully by Spring, we’ll have their products on our shelves. William Kovel, Chef/Owner of Catalyst "Giulia in Porter Square. I also really want to go to Boston Chops in the South End. I'm eager to see what Chris Coombs does with steak!"